At the latest BuildBrighton meeting, (Thursday nights at the Skiff) we managed to get a working prototype of our cube and a tray/reader. This message repeats over and over again. 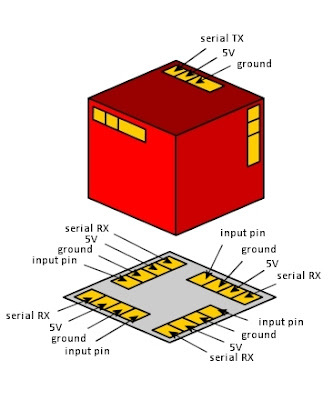 The cube has three pins, one slightly longer than the others, so that when the cube is in place, in the reader, it pulls one of the input pins on the tray to ground. This is how the tray detects the presence of a cube. The cube also looks at which of it’s own PORTB pins has been pulled low (the input pins have internal pull-ups on them, so be default the input on all PORTB pins will be high). From this, the cube knows which face is face-down in the cube. The reader has four trays and is connected to an 18F4550 PIC microcontroller. If a cube is present in tray1, one of the first four pins on PORTD will be pulled low (by the larger pin on the cube, bridging the contact between input pin and ground). The tray/reader then knows to start reading serial data on the tray one serial RX pin (there are four serial RX pins, one for each tray, and all serial pins in tray one are connected, all serial pins in tray two are connected, and so on). When in place, the cube draws its power from the tray/reader and starts broadcasting. By the end of the BuildBrighton evening we managed to acheive all of this, using a mixture of home-made PCBs and some breadboarded circuits. Although not exactly cube-shaped, the principle was tested and proved to work!